Message: S_FT_DA_NO_RESPONSE or Da didn't send response data to FlashTool! 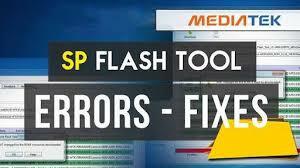 What you should know about SP flash tool is that you shouldn't interrupt a flash or read back process. If you do, the phone will go off and not come on at all. You might get the "USB device not recognized" error on further flashing attempts. If somehow, the process got interrupted and you now have a totally dead phone on your hands, don't panic. All you need to do is connect the phone to a computer (via a USB cord) or power source and leave it to charge for some time. It could take up to two hours but once the phone is revived, your battery could read as low as 1% . just leave it to keep charging before powering it up. TOOL DL image Fail ! Message: TOOL DL image Fail ! Message: Boundary Check Failed: rom_end_addr >= next rom begin_addr. * If that doesn't work, open and modify the scatter file using Notepad++ then change "boundary_check: True" to "boundary_check: False"
Solution: Use "download only" under the download tab to flash the firmware then you can format if need be. Please if you miss anything, just leave your comments ..